This article is about the British TV series. For the computer learning program, see OutNumbered! For the Fox News program, see Outnumbered (U.S. TV program). Outnumbered is a British sitcom starring Hugh Dennis as a father and Claire Skinner as a mother who are outnumbered by their three children (played by Tyger Drew-Honey, Daniel Roche and Ramona Marquez). Other regular actors and actresses have reprised roles as supporting characters throughout the five series, including Samantha Bond, David Ryall, Rosalind Ayres and Hattie Morahan. There were five series, which aired on BBC One from 2007 to 2014. A Christmas special aired on 26 December 2016. More specials are planned after the success of the 2016 Christmas special. Produced by Hat Trick Productions, Outnumbered was written, directed and produced by Andy Hamilton and Guy Jenkin, although parts of the show are semi-improvised. The adult actors learn the scripts, while the children are given last-minute instructions by the writers instead. The programme has received critical acclaim for its semi-improvisational scripting and realistic portrayal of children and family life. Ratings have been average for its time slot, but the series has won a number of awards from the Comedy.co.uk awards, the Royal Television Society, the British Comedy Awards and the Broadcasting Press Guild. The first four series and the two Christmas Specials have been released on DVD. Plans for an American adaptation were announced in February 2009, but as of September 2016[update] this has not materialised. The original series began airing in the US on BBC America on 30 July 2011, as well as airing on PBS stations. 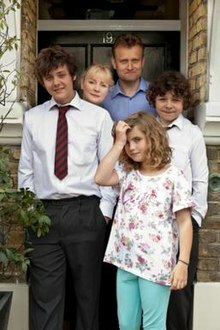 Outnumbered is centred on the Brockmans, a middle-class family living in West London, whose two parents are "outnumbered" by their three somewhat unruly children. The father, Pete (Hugh Dennis), is a history teacher at an inner city school and the mother, Sue (Claire Skinner), is a part-time personal assistant and is four years younger than Pete. The three children are: Jake (Tyger Drew-Honey), the straight man of the family, whose teenage sarcasm and obsession with girls worries his mother, Ben (Daniel Roche), who is hyperactive, a pathological liar, does unusual things, and is always coming up with hypothetical questions like "who would win in a fight between...", and Karen (Ramona Marquez), who asks too many questions, frequently imitates a lot of what she sees on television and criticises nearly everything. Other regular characters include Sue's new age sister, Angela Morrison (Samantha Bond), and their elderly father Frank (David Ryall), referred to as "Grandad", who is in the early stages of dementia. He is a silent and deceased character in the 2016 special. The writers also use the popular sitcom device of the unseen character in the form of Veronica, Sue's demanding boss in series one. In series two, the device is used again, but in the form of Sue's new boss Tyson, who is revealed to be a conman who absconds in the final episode of the series. Series three introduces Rosalind Ayres as Pete's mum Sandra, referred to as "Gran", who is addicted to online gambling and has a growing hatred for Pete's father. Other new characters in Series 3 include Kelly (Anna Skellern), on whom Jake has a crush, Angela's new husband Brick (Douglas Hodge), who is an American therapist, and his daughter Taylor Jean, who wants to live with her mum. Also introduced is a campaigner against council plans to place speed bumps on the road (Alex MacQueen) who pesters the family. By series 5, the Brockman children have changed considerably. Jake has developed a penchant for engaging with a suspect crowd of friends, and a general teenage cockiness. Ben has doubled in size and strength, but not his maturity. And the pre-teen Karen has become moody, sullen and developed a superiority complex. Outnumbered was the first collaboration between Hamilton and Jenkin since Drop the Dead Donkey ended in 1998. It was commissioned by BBC controller Lucy Lumsden. The executive producer is Jon Rolph. The 20-minute pilot was given to Lumsden, who then commissioned six episodes. The show is set in Chiswick, West London, and shot on location in Wandsworth. The house used for external shots is in Dempster Road. During the second series, the family receive a final demand for council tax from the fictional "Limebridge Council", sent to the fictional address of 19 Keely Road, London, W4 2CF. You rarely get the feeling that children in sitcoms are real. They tend to be the same type of character – the smartarse who says adult things – and they are rooted to the spot, staring at the camera, because they've been told to stand in one place and say the lines. We decided to attempt to do something that hadn't been tried before, bounced some ideas around and we got very keen on this idea of involving improvisation very quickly. The fourth series began on 2 September 2011 at 9.00 pm on BBC One. After the series had aired, Tyger Drew-Honey suggested that there would be no fifth series because he and the other child actors were growing out of their roles. BBC Television's Head of Communications, Sam Hodges, reassured fans of the series that "contrary to reports, talks are already under way regarding a new series". The fifth and final series was confirmed by BBC and began to air Wednesday 29 January 2014. The series comprised six episodes. The first episode received 4.1 million viewers (25.5% of the audience share) when it began and finished with 2.8 million (19.5%) at the end, which is larger than the average 2.2 million (14%) normally attracted by television shows in its particular time slot. The audience for the second episode fell by half a million viewers, while still being the highest ranking show in its time slot, with 18% of the audience share. However, it maintained a constant audience throughout the first series, with the fourth episode attracting 2.7 million viewers (20% audience share). compared to the ridiculous carry-on of My Family, it's much more low-key and realistic. In fact it's so low-key, nothing actually happens, which could well be a nod to Seinfeld – the touchstone of all great sitcoms. The getting ready for school chaos is like Supernanny: The Movie only with nicer children. It's also taken a leaf out of Curb Your Enthusiasm's book with large chunks of improvisation – although the strongest language you'll find here is "ponk". Outnumbered was at its most meretricious. For every exchange between adult and child was hijacked by a crass sitcommy need for sotto voce punchlines and knowing winks to the wings. A protracted scene in which 45-year-old dad (Hugh Dennis) was unable to wrestle a live power drill from the hands of 7-year-old son Ben (Daniel Roche), and instead had to, ho-ho, pay him £5 for the privilege, was emblematic of the show's dubious capacity for fake pay-offs. Rod Liddle, writing in The Sunday Times, praised the show, although he was somewhat surprised, saying, "An exquisitely middle-class, middle-aged domestic situation comedy set in West London – and starring one of those bloody stand-up comics who now festoons every network, it really should be hated before it is even seen. Start liking this sort of programme and you are an ace away from enjoying Terry and June and having a house that smells faintly of weak tea, Murray Mints and urine. So, maybe it's just me, but Outnumbered is very funny indeed: despite its current bout of self-flagellation, the BBC still knows how to make people laugh. Comedy may be the very last thing the corporation does well." James Walton wrote in The Daily Telegraph that the domestic setting and more mundane storylines were a virtue, saying, "All of this feels both carefully observed and suspiciously heartfelt. More unusually, it's not contrived. Outnumbered sticks firmly with the mundane, yet manages to be funny about it. It doesn't avoid the sheer dullness involved in family life either – but, happily, depicts it with a winning mixture of exasperation and affection." He did, however, criticise the scheduling of the programme saying, "Despite the very specific London setting, the series (shown in two batches of three, this week and next) will surely appeal to the parents of young children everywhere. As long, that is, as they're not asleep by 10.35pm." In 2008 review in The Times, Bryan Appleyard described Outnumbered as "the best British sitcom in years and among the best ever". Outnumbered was nominated for the 2008 "Broadcast Award" for "Best Comedy Programme", but lost the award to The Thick of It. The show was given the "British Comedy Guide Editors' Award" in The Comedy.co.uk Awards 2007 and the "Best Returning British TV Sitcom" in The Comedy.co.uk Awards 2008, beating Peep Show by six votes. In 2009, it won the Royal Television Society Award for "Scripted Comedy", and two Broadcasting Press Guild Awards in the same year: "Best Comedy/Entertainment" and the "Writer's Award". Outnumbered also won three awards at the 2009 British Comedy Awards: Best Sitcom, Best British Comedy and Best Female Newcomer for Ramona Marquez. The show has received four BAFTA TV Award nomiations: Best Situation Comedy, the Audience Award, and Best Comedy Performance for Claire Skinner in 2009; and Best Male Performance in a Comedy Role for Hugh Dennis in 2010. At the National Television Awards in 2011, Outnumbered was nominated for Best Comedy but lost out to ITV's Benidorm. It was nominated again the following year and won. All five series and the three Christmas specials are available on DVD. The first Comic Relief special is available on the Series 2 DVD, the first Sport Relief special is available on the Series 3 DVD and the second Comic Relief special is available on the Series 4 DVD. It has been said that the second Sport Relief special will either be available on the next Christmas Special DVD or the Series 5 DVD (if they will be filmed or if they have been filmed). The DVDs have been published by 2 Entertain. ^ "Outnumbered: Overview". British Comedy Guide. Retrieved 22 August 2008. ^ Wyatt, Daisy (15 January 2014). "Outnumbered to end after final fifth series". The Independent. London. ^ Methven, Nicola (16 July 2013). "Outnumbered WILL return for another series, Hugh Dennis reveals". Mirror. Retrieved 28 August 2013. ^ a b Tyers, Alan (16 August 2007). "Hugh not reading the script". The Sun. London. Retrieved 22 August 2007. ^ Deacon, Michael (1 April 2010). "Andy Hamilton on the secret to Outnumbered's success". The Daily Telegraph. London. ^ a b Appleyard, Bryan (30 November 2008). "Outnumbered the British sitcom grows up". The Times. London. ^ "Awards". Internet Movie Database. Retrieved 16 January 2011. ^ Holmwood, Leigh (9 February 2009). "Fox to air US remake of Outnumbered". London: Guardian. Retrieved 10 February 2009. ^ "Outnumbered on BBC America". Retrieved 4 August 2011. ^ a b c d e "Press Office: Outnumbered". BBC. 17 August 2007. Retrieved 22 August 2007. ^ "Episode 6". Outnumbered. Series 1. 28 August 2007. ^ "Episode and 4". Outnumbered. Series 1. 3 September 2007. ^ "Press Office: Outnumbered Episode Synopsis". BBC. 17 August 2007. Retrieved 22 August 2007. ^ "Outnumbered Characters". British Comedy Guide. 28 August 2007. Retrieved 22 August 2008. ^ "Claire Skinner". Woman's Hour. 1 September 2010. BBC Radio 4. Retrieved 18 January 2014. ^ "Press Office: Outnumbered Introduction". BBC. 17 August 2007. Retrieved 22 August 2007. ^ "Outnumbered - Production Details". British Comedy Guide. Archived from the original on 19 January 2014. Retrieved 19 January 2014. ^ "Series 2, Episode 5". Outnumbered. Series 2. Episode 5. 13 December 2008. ^ "Outnumbered Episode Guide". British Comedy Guide. ^ "'Outnumbered' to return for fifth series? - TV News". Digital Spy. 6 January 2012. Retrieved 30 January 2012. ^ Connolly, Lynn. "BBC confirms that Outnumbered WILL be back for a fifth series!". Unreality Primetime. Archived from the original on 21 September 2013. Retrieved 5 August 2013. ^ a b c "Monthly Performance Pack : April 2010" (PDF). Downloads.bbc.co.uk. Retrieved 1 June 2015. ^ a b c "Monthly Performance Pack : May 2010" (PDF). Downloads.bbc.co.uk. Retrieved 1 June 2015. ^ a b c d e "Monthly Performance Pack : February 2014" (PDF). Downloads.bbc.co.uk. Retrieved 1 June 2015. ^ a b c d "BBC_iPlayer_performance_monthly_0911.pptx" (PDF). Retrieved 3 June 2014. ^ "Big Brother launches with 2.6m on Channel 5". Digital Spy. 10 September 2011. Retrieved 3 June 2014. ^ "Tashie Jackson's Big Brother eviction seen by 1.8m". Digital Spy. 17 September 2011. Retrieved 3 June 2014. ^ "Ricky Gervais's 'An Idiot Abroad' tops 'X Factor'". Digital Spy. 24 September 2011. Retrieved 3 June 2014. ^ "'Shirley' delights nearly 2.7m, 'Glee' loses viewers". Digital Spy. 30 September 2011. Retrieved 3 June 2014. ^ "Maisy James's Big Brother eviction watched by 1.5m". Digital Spy. 8 October 2011. Retrieved 3 June 2014. ^ "Celebrity Big Brother final attracts 3 million on Channel 5". Digital Spy. 30 January 2014. Retrieved 3 June 2014. ^ "Outnumbered rises to over 4.8 million on BBC One". Digital Spy. 6 February 2014. Retrieved 3 June 2014. ^ "Midsomer Murders' Killing and Borgen crossover attracts 5.5 million". Digital Spy. 13 February 2014. Retrieved 3 June 2014. ^ "Brit Awards 2014 attracts lowest ratings ever". Digital Spy. 20 February 2014. Retrieved 3 June 2014. ^ "Outnumbered rises to top Wednesday with 4.3 million". Digital Spy. 27 February 2014. Retrieved 3 June 2014. ^ "Outnumbered concludes with 4.3 million on BBC One". Digital Spy. 6 March 2014. Retrieved 3 June 2014. ^ "'Cranford' bows out to 5.4 million". Digital Spy. 29 December 2009. Retrieved 3 June 2014. ^ "'EastEnders', 'Merlin' help BBC One lead Christmas Eve ratings". Digital Spy. 25 December 2011. Retrieved 3 June 2014. ^ "Monthly Performance Pack : December 2011" (PDF). Downloads.bbc.co.uk. Retrieved 1 June 2015. ^ "Merlin, Mrs Brown's Boys, Outnumbered lead strong night for BBC One". Digital Spy. 25 December 2012. Retrieved 3 June 2014. ^ "iplayer performance dec12" (PDF). Retrieved 3 June 2014. ^ "News - Outnumbered starts with great ratings". British Sitcom Guide. 29 August 2007. Retrieved 29 August 2007. ^ Dowell, Ben (30 August 2007). "Supernanny and Silent Witness take lion's share". London: Guardian. Retrieved 16 October 2007. ^ Dowell, Ben (5 September 2007). "Hell's Kitchen goes off boil". London: The Guardian. Retrieved 16 October 2007. ^ "Outnumbered". Daily Mirror. 28 August 2007. Archived from the original on 31 January 2009. Retrieved 29 August 2007. ^ Maher, Kevin (29 August 2007). "Last night's TV". London: The Times. Retrieved 29 August 2007. ^ Liddle, Rod (2 September 2007). "The cheap laughs are the best". The Sunday Times. London. Retrieved 2 September 2007. ^ a b Walton, James (29 August 2007). "Last night on television: Silent Witness (BBC1)/Outnumbered (BBC1)". London: Daily Telegraph. Retrieved 29 August 2007. ^ "News - Broadcast Awards 2008 shortlist revealed". British Sitcom Guide. 10 December 2007. Retrieved 11 December 2007. ^ "Broadcast Awards 2008 - Shortlist". Broadcast Awards. Archived from the original on 19 January 2008. Retrieved 15 January 2008. ^ "The Comedy.co.uk Awards 2008". British Comedy Guide. ^ "RTS Programme Awards winners 2009 in full". London: Guardian. 18 March 2009. Retrieved 18 March 2009. ^ "Broadcasting Press Guild award winners". London: Guardian. 27 March 2009. Retrieved 27 March 2009. ^ "Outnumbered Series 4 - Christmas Special [DVD]". Amazon.co.uk. Retrieved 8 November 2011. This page was last edited on 25 March 2019, at 18:42 (UTC).